Kährs and wood. A 150-year love story. Nature is our inspiration, and our provider It's not a matter of processing raw materials, but of making the most of wood's intrinsic beauty and expressiveness. So, we assess each individual log, and exploit its natural shape and pattern to create a unique wood floor character. 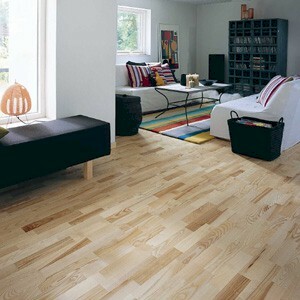 But if the floors are to remain beautiful whilst tolerating year of wear tear, they also need inherent quality. Because we've worked with wood since 1857, you can be sure of getting everything you have the right to expect from a genuine, quality wood floor. A major milestone in our history, and in the history of wood, was passed in 1941 when Gustaf Kähr, grandchild of our founder, was granted a patent for multi-layer parquet board. The world's first engineered parquet came to light. This construction made the floor more stable, and utilized the raw material in a new way that gave greater consideration to resources. And today it still forms the basis of the technique we use to manufacture our floors. There are countless other examples of innovation in our history as a floor manufacturer. In the 1960s, for example, we were the first to offer floorboards with a factory-applied pre-finish, a revolutionary innovation that rapidly became an industry standard. In the 1990s we were the first floor manufacturer to achieve demanding quality and environmental certification. And in 2000 we introduced the world's first, and only, parquet floor with the glueless woodloc joint, for faster laying and perfect results.